After a nine-year absence from the Volkswagen line-up the Golf Cabriolet is back, and orders are now open. Prices start at £20,720 on-the-road. The new model is styled much like the Golf hatch at the front, but a heavily raked windscreen, new rear lights and a distinctive boot set it apart from the run-of-the-mill hatchback version, as, of course, does the folding fabric roof. The roof can folded in under ten seconds at speeds of up to 18mph, making life easier in showery Britain because you don't have to find a side-road to stop on when you need to open or close it. The body of the Golf Cabriolet has been reinforced to ensure a high level of structural rigidity, improving safety both through the bends and in an accident. On top of this, active roll over protection, ABS and ESP are all standard, as are front and side head/thorax airbags. There are three trim levels, S, SE and GT, and three engines, a 105PS 1.2 TSI, a 160PS 1.4 TSI and a 105PS 1.6 TDI. Three more engines (one petrol and two diesel) will be added later in the year, as will Bluemotion technology and a DSG gearbox option. Prices start at £20,720 on-the-road for the 1.2-litre TSI in S trim, rising to £26,596 for the 1.4-litre TSI in GT trim. 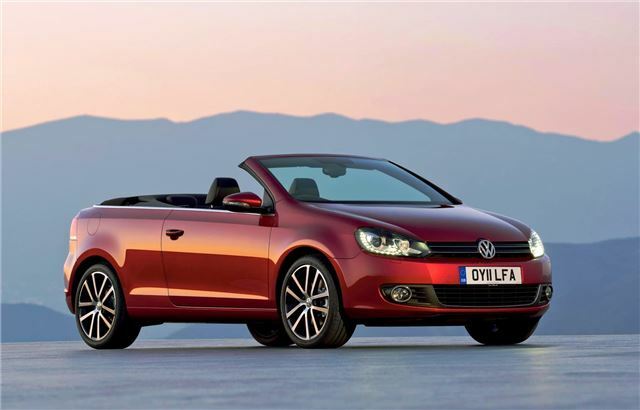 For more information on specifications and for a full review of the Golf Cabriolet, click here.